Jesus took on the wrath of God that is meant for us. 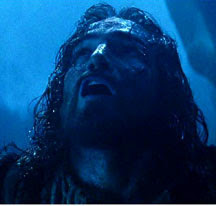 At the cross, Jesus cried out with a loud voice, "Eloi, Eloi, lema sabachthani?" which means, "My God, my God, why have you forsaken me?" (Mark 15:34). For far too many times, I was being told and retold that Jesus was reciting Psalms 22:1 without much being reminded of the reason for it being uttered. John Stott himself said that while the people there at the cross at that time misunderstood it, thinking that Jesus was calling for Elijah, many today still misunderstand it. Some suggest that is was a cry of anger, unbelief or despair. Some understood it to be a cry of loneliness. Some said Jesus was uttering a cry of victory, using the first verse of the psalm to represent the whole of the psalm which ends with great confidence and triumph. Some even took it as a simple and straightforward cry of real dereliction. But these are not why Jesus cried out those words. He called out to the Father - calling Him his God - crying why has He forsaken him - in the darkness, he was alone, he was God-forsaken. As Calvin put it, "If Christ had died only a bodily death, it would have been ineffectual ... Unless his soul shared in the punishment, he would have been the Redeemer of bodies alone." In consequence, "he paid a greater and more excellent price in suffering in his soul the terrible torments of a condemned and forsaken man." So then an actual and dreadful separation took place between the Father and the Son; it was voluntarily accepted by both the Father and the Son; it was due to our sins and their just reward; and Jesus expressed this horror of great darkness, this God-forsakenness - God has reconciled the world to himself in Christ. C.E.B. Cranfield emphasised that Jesus experienced not merely a felt, but a real, abandonment by his Father, but the paradox is that while this God-forsakenness was utterly real, the unity of the Blessed Trinity was even then unbroken. (Stott, 81-82). I needed so much to be reminded of this. Through the years, the message has somehow became diluted. It has not been taught enough, not been reminded of, not been meditated upon much. My attention was mainly directed to the bodily pains of Christ. The death meant to me just something temporary because after death came resurrection anyway, because Jesus is after all, the Son of the Living God. But now that I am being brought back to the reality of Christ's sacrifice on the cross. He gave up more than his bodily life. He experienced a separation from the Father, with whom he has had eternal communion from everlasting. He experienced the separation that is rightfully ours, for our sake. So that we can be reconciled to God through him. Oh, such is the steadfast love of the Lord. Just imagine: though he was in the form of God, did not count equality with God a thing to be grasped, but made himself nothing, taking the form of a servant, being born in the likeness of men. And being found in human form, he humbled himself by becoming obedient to the point of death, even death on a cross. (Philippians 2:6-8). What kind of a God would do that? If you have created something and it turns bad - discard it, no big deal. But we are more than a big deal to God. More than fixing us, he made himself one of us, so that we can be right before God on his account. He died so we may live. He got forsaken so that we may be returned to God, holy and justified, redeemed and made righteous. But first, he has to die. J.I. Packer, Knowing God, 218. Beautiful! Thank-you for writing this our and sharing this with us. I enjoyed this very much. The Philippians passage puts it all in perspective. Happy Easter Pearlie - He is Risen! Great to see you here Jenileigh! Pastorpher, I was half sleeping this morning during dawn prayer and I kept wanting to check this passage out but never got to it. I was seriously half asleep! I tell myself - check out the passage, I get distracted, then what was I to check again? After several cycles of that ... prayer meeting was over!